If you are looking for an efficient, reliable hosting that will get the job done with a minimum of effort from your part, when you should certainly take WordPress hosting into consideration. Now that WordPress has a brand new engine that allows you to host and manage several different domains under the same account, bloggers will find it a lot easier to post articles and to enjoy the new WordPress hosting service, which comes with improved speed and security, as well as a fully managed support service. As many customers claim, WP Engine is one of the best solutions available when it comes to WP hosting services. 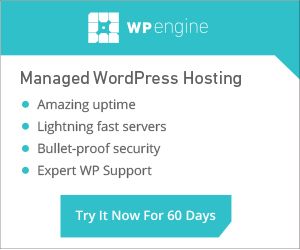 WPEngine – Why Opt For WordPress Engine? It is normal to be slightly skeptical at first, since WP Engine comes with a series of innovative features and functions that make it stand out from the rest. The expert WP support service is only one of these features: high-quality customer support is essential to keep the bloggers satisfied, as not only beginners but also professional bloggers might have questions that need to be answered. WP Engine offers top-notch support services, and all the questions will be answered in a timely and efficient manner by the staff of WordPress experts that work at WP Engine. If your questions have been left unanswered, then know that this will no longer be the case with WP Engine! We live in the century of speed, this is why the page loading time plays a pivotal role for the success of every website. The harder a website loads, the more likely it is to lose its visitors in the long run. In addition to this, the latest Google algorithms also take into account your website’s page-load time when calculating the search engine ranking of your website, this is why you should not neglect it. Fortunately, WP Engine comes with a high-quality, custom-build technology that will load your WP pages at a considerably faster pace, so you do not have to worry about losing readers or having your page ranking lowered by Google. This is possible thanks to the latest EverCache technology implemented by WP Engine – you no longer have to bother configuring caching plugins ever again, as this technology will do it for you in a fast and effortless way. Besides, another important aspect is that you can have as much traffic as you can gather – your WP website will always stay up and running, regardless of your number of daily readers! With so many hackers out there, it is essential to know that your personal information and blog posts are always safe and sound – we perfectly understand this, and for this reason we provide automated scan services and instant fixes, should any hacker try to attack your website. We are always struggling to provide the best anti-hacking services and we will address every attack quickly and professionally, without any extra charge. Unpleasant situations can occur at any time – when they do, it is essential to have all your data backed up. We understand that constant backups can be not only a daunting task, but a quite expensive one as well – this is why we have added a simple and efficient backup option completely free of charge. The latest WP security updates are installed automatically, so you do not need to worry about the security of your site. We have taken care of everything on your behalf! We always pay attention to the needs and preferences of our customers, this is why we have come up with a list of innovative, user-friendly and useful features that will allow you to create new pages and implement new site changes or themes with only the click of a button. You can now implement the latest updates and themes in a matter of seconds, and you do not even need previous experience with WordPress to do it – yes, it is that simple! Last, but not least, WP Engine also comes with a generous selection of curated themes and plugins to choose from. Our plugin developers are struggling to deliver the perfect plugin that meets your needs and, at the same time, we deliver a wealth of themes you can use to personalize your website. If you want to customize your WordPress website, we offer you a selection of high-quality tools and services to help you do that, without any extra charge. We also offer moving transfer services if you have decided to use WP Engine, and the migration cost is directly linked to the type and size of your website. For further details along with a price estimation, feel free to contact us and we will get back to you as quickly as possible!